We’re always pleased to welcome new companies to the Jack, with bold and ambitious ideas. Throughout the year we programme a diverse mix of productions, providing a platform for new writing, innovative revivals of classic texts and musical theatre. Companies who bring their work to the theatre are offered help with free rehearsal space, as well as marketing support and practical advice on how to realise your project. We also provide box office staff, and assistance on your get-in and get-out. We programme runs of two – four weeks. We do not programme one-off performances. 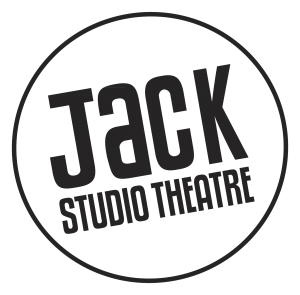 The Jack has a very competitive hire fee, and we offer box office splits. For more information about what to expect during your time at the Jack and booking options, please click here. If you have a theatre project you’d like to bring to life, we’d love to hear from you! We hire the rehearsal room (10mts x 7mts) on a daily or weekly basis. The rehearsal room has a fridge, microwave and tea and coffee making facilities. It also has sound equipment and wi-fi. We are happy to arrange a time for interested companies to visit the theatre, should the project be suitable for our programming. Due to the number of enquiries we receive, we aim to respond to you within three weeks. Please note we are not able to give feedback on unsolicited scripts or on proposals that we are unable to programme. For examples of recent progamming please see our range of past productions. The studio provides an intimate performance space, with comprehensive lighting and sound equipment. The Jack has raked seating. This layout is flexible and the space can be transformed to seat the audience end on, in three sides or in the round. Capacity is 50 for end on and three sides, and up to 63 for in the round. Please contact the theatre if you have any problems downloading these files.